LauraN’s handknit octopus boogie-boarding a witch’s hat across a beanbag pumpkin. Costumes were never my strong suit. I just looked. Point two four inches? How was all that rain only .24″? They were predicting twice that. That hapless raccoon. Here comes diabetes in a trash can, ready for the raiding. The flu, the flu, the flu, (the autoimmune Crohn’s and lupus playing alongside), the cystitis. And then today, after five weeks, I finally got to go off to knit night again. At last. It is amazing how restorative it is to just sit and knit and catch up with good friends for awhile. There was one summer evening at Purlescence probably two years ago where Sandi and Kaye had a big bowl of huge strawberries set out for the nibbling. They belonged to an organic farmshare and it was the peak of the season. Those strawberries tasted like the ones my family drove an hour to a pick-your-own place near Camp David to get when I was growing up–and nothing like the grocery store’s. Wow. I went home and looked their supplier up and the demand was greater than the supply; new customers were not being accepted. Saw something today and finally went looking again. I’d wanted for a long time to know what a heritage-variety Spitzenberg apple tastes like; I’m not going to plant a tree that’s a question mark. Our first Full Circle box comes next week. Spitzenbergs will be in it. I can’t wait. p.s. Hat, finished, scarf, finished, baby dress, finished, baby blanket, finished. Happy Aftober! TWO! I have *never* seen them hunt in tandem before. The first hawk swooped down, appearing suddenly from above the awning and right back up above again in a half-circle to herd the prey. Then immediately after a panicked mourning dove bonked its head on the awning and staggered away out of there, the hawk’s mate burst out from among the elephant ears on the patio and after it. Two! I had no idea the second one was there. Maybe come spring I’ll finally get to see a Cooper’s fledgling toddling around my amaryllis pots again–it’s been a few years. Meantime, the baby blanket: it is celebrating Aftober after all. I DID it!! The pop-tent: one side on the ground, one side not quite and I can’t get it to fold flat anymore, so this is how we got yesterday’s story. After swooping around the patio, today it was the hawk that landed on the edge of the square tomato cage. Wow, I really wasn’t expecting that. What I couldn’t see was that he had flushed out a dove and it was now cowering somewhere at the bottom of that pop-tent–or somewhere right around there. The blueberries are in an identical cage next to it with room for me to walk between the two but not for his wide wingspan. All I knew at first was that he hadn’t caught what he’d gone after and he was standing on that thing and looking at me. My iphone was a short stretch away and while I was debating reaching for the camera vs. scaring him away, he fluttered his wings and released his talons awkwardly from that thing, gripping again and shifting sideways a bit, giving me a good profile view: long and lean and nothing in his crop–he was hungry. Suddenly he swooped in a very tight circle around that small cage and then again, reaching down into the canyon between with his feet till a flurry of gray suddenly exploded out of there at last in a panic. He was determined not to let it get away this time. I had not noticed that during this, the neighbor’s very large white-faced black cat had entered the picture and was watching the show at the end of their fence at the T-intersection where it suddenly drops down a foot to mine. And the mourning dove was going straight for that cat. Wait, what? I mean, I know doves are hardly the smartest, but…! Just as the three of them intersected visually from where I was sitting there was an explosion of small feathers and at first I wasn’t sure if the cat had taken a swipe or if the hawk had grabbed for it but from the trajectory as they poofed backwards not sideways, it had to have been the hawk. The dove still had its flight feathers and was using them for all it was worth but the hawk was right there closing the last of the gap. And then they disappeared over the fenceline straight past the cat’s nose, so as usual, I got all the drama and none of the gore but thankfully the cat could only say the same. The bottom photo here: note that there are two different sizes and thicknesses of birdnetting there. That’s where they meet. The side of the house cuts off most of my view of the tomato cage (and cage it is) unless I get up from here and walk to the far side of the room to look across thataway. But one small finch trying to perch on the near edge of it caught my peripheral vision and my attention: birds don’t usually land there. It shifted over to the metal pole bordering the thing where its feet could at least grip far more easily than directly on the netting but it would not leave. Turned out (when I got to the window) there were three or four more–this was highly unusual–and they were on the pop-up, which has no such metal resting spots. When I had the flu, the tomatoes got their second wind and started blooming and producing all over again: that one slug I’d killed must have been devouring every flower for over a month. But since I wasn’t paying much attention while I was sick in bed, the stalks grew outside the netting and there was no good way to scoot the flowers safely back inside without risking breaking them off. I had that pop-up birdnetting tent that I had written off as a bad investment: the bottom edges could not be secured and the birds kept getting in down there and stuck. Pretty useless when the whole idea is to keep critters out. But hey. If I leaned the thing all flattened out against those new tomatoes and their square cage, that would work. Five nights into this a raccoon pulled the tent over on its head. Eating the plastic clamshell on the apple tree, falling as it broke 2/3 of the young peach tree off trying to climb it (and still not getting the peaches), pulling the tableful of clay pots down on its head–that raccoon’s had it rough here this season. The tomatoes were left untouched. I put the tent back and the raccoon has now been leaving it alone. But I couldn’t get it to go entirely flat again. Almost but not quite. I could only hope it wouldn’t trap anything. House finches are a squabbly lot. They play king of the mountain, they attack and peck and keep their fellows away from the best perch or sometimes any perch on the feeder, guarding and owning it all unless a bigger bird lands. MINE! They will often chase each other around and around the base of the platform feeder despite there being plenty for all. This afternoon one small finch wandered in at ground level and got caught inside that unwanted sliver of space within that leaning birdnetted pop-up. She was desperate to fly out the top. Which she could not do. Those other finches had felt compelled to leave the feeders to flock with her in her extremity. They were forsaking food at a time when the area was hawk-free to go over to where she would have the comfort of their presence close by, even when it was uncomfortable for their feet or at least difficult to hold onto after landing. That first finch got my attention but the fact that there were others tipped me off. I went outside, sun or no sun, knowing it would just take me seconds, and I tipped that tent. Her instinctive need to escape up was tempered by the fact that I was now towering over her and so down she went to get away from me–and at last discovered the opening at the bottom. Of all the species of birds that come to my feeders, it is these that squabble the most over what seems such dumb stuff to me that are the ones that are the most steadfast in looking out for their peers in their moment of need. Knitting and all the happy anticipation of a beautiful blanket for a coming granddaughter is fun. Sitting icing your hands afterwards for twenty minutes, no stitches, no turning pages, no clicks, not as much. So as I iced I was doing the math in my head. Sixty-six rows in the last three days. Two hundred eighty-eight needed altogether, unless I decide to add another 16-row repeat or two past where I’m currently aiming for. But as planned that means I have 75 rows to go. 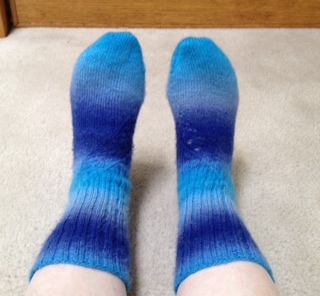 My friend Afton recently threw out her annual challenge to all the knitters she knew to finish a project or projects, something you’d been wishing were done, before the end of this month. It looks like I’ll make it. Aftober here I come! Well, that was an interesting day. And it’s not my story to tell here. But there are times when a kid needs more than a hug from their mom; having a sibling with expertise in the field was the best thing, and so the one called the other immediately and pretty much settled that right then and there and made everything okay again. Phew. I love that my kids look out for each other like that. Writing it in case I need to look up later what which when: the antibiotics aren’t quite enough on that cystitis yet (but far better than not having them), while the Crohn’s tries to hog the attention. I think I need to move up that GI appointment. And so: I put my feet up and got 21 rows of 189 stitches done so far today. I happened to be outside for just a few steps’ worth when I saw, ascending above me and then very high, not one but two hawks. Definitely not turkey vultures but hawks. Gliding on the thermals, circling away and then back around to each other in an intricate dance, and if I had wondered at all if Coopernicus still had the mate I saw him courting in February that definitely seems to be a yes. In several minutes’ watching there was one single leisurely wingbeat to catch the best of an updraft as they gradually spiraled into the distance. Then this evening I went out to water the pear tree. Coming out the door, I glanced at the neighbor’s redwood: it and the silk oak just past the other side of our property are the two that the ravens and the hawks are always duking it out over. No sign of any bird at all. –and then a burst of movement from fairly low down and close by as the Cooper’s hawk cakked at me for invading as it stormed out of there. Wait–I forgot to sing to them to get them going. Well then. Another half a minute of watching them and me and then finally convinced it was safe, a raven, one single raven, suddenly flew from behind the mockingbirds, giving the most subdued half-hearted single caw I have ever heard out of one of them. It was going sideways from the trajectory of the Accipiter Cooperii to arc around my yard, not quite directly over, flapping hard while heading towards that redwood now that it knew that the hawk would not be there to challenge it. See?! King of the mountain! So there! Hawks glide smoothly even when their wings are going. Corvids’ bodies kind of bounce up as their wings go down and slump down as they lift their shoulders up for the next beat as if they’re just barely keeping this heavy thing airborne. Airdancing this morning, make-a-break-for-it dancing in the evening. And even though the raven would tell you the results are up in the air, he was just winging it. The hawks are definitely the more talon-toed. 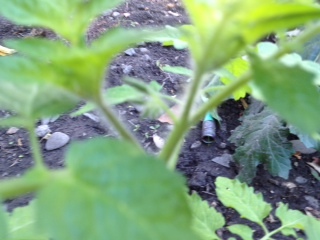 Tomato plant pictures: the volunteer that’s a month old and a view of its new buds. Hoping to get Ellen in her much colder climate some quick-grows for next year from this thing. And then there’s the heirloom variety still going after six months. Meantime, yup, tried the cranberry juice, tried the vitamin C, but still woke up with a trip straight to the doctor. Thankfully there are still some antibiotics that have not yet been made useless by the unethical feedlot practices of the big bioag producers, and so I am no longer passing blood. So of course I forgot to take its picture, but. I just thumbed through the blog a bit–it was only a month ago? Huh. That surprise tomato that the squirrels planted by the cherry tree has buds already. At one month old. I’d love to save the seeds from that one. The way the heat keeps on coming here this year, we might actually get that crop. Met up with the new knitters tonight as planned and they’re coming along, too. It was fun to see. A hawk sighting today. A smattering–I like that word, it sounds just like it and it lasted only slightly longer than saying it–of rain. And a viral video about the way to open a pomegranate. Actually, we had one waiting to be tackled. Now, I did not know till sampling a grower’s wares at a show last year and looking up the trees later that there are all kinds of pomegranates: there are the sour puckery ones and there’s a variety that is just plain sweet sweet sweet and there’s a range in between. That grower had dark-juiced sweet ones and her products were a revelation. Good stuff. So I tried what the video said: you cut off the top jack-o-lantern style and then down the white lines that separate sections of seeds. Pull them down, pluck out the whites, and tadaah! Lemme tell ya, hon, it ain’t that easy. But then I wasn’t going to eat mine corn on the cob style anyway. There’s this small issue of my not being able to eat the seeds, just the juice, but I’d read that you just throw them in a blender or cuisinart and then strain away the solids. The timer on the oven was going. The white lines went straight down only halfway and then sideways into randomness. Trying to pry all those little arils out of there, I went past ten minutes with the thing and thwacking the fruit on the counter beforehand hadn’t loosened them away any. I have no way to know how ripe it had been allowed to get or whether that factored in. Don’t forget the apron I forgot. Plate, cuisinart, strainer, bowl: half a dishwasher load, while cleaning pomegranate squirts off my sweater and trying to thwack all that grit out of the strainer into the trash. Dozens of those at a time? A hundred? A tad reluctantly, but, I think we can scratch pomegranate trees off my list. Skylake won’t mind doing the work. Francie! Twenty years and we still recognized each other. Okay, the context of being at church helps, but still! Our children had been little together, mine about five years ahead of hers and Ken’s. Ken had grown up here, they had lived here with their first baby, then second, and then had moved to where she grew up. New Zealand is a little bit far for a quick drop in and visit. Turns out they had since moved back to the States, just not this one. But for whatever reason, they were here just for today and were hoping to see old friends and we were very happy to oblige. Turns out also that a woman he’d grown up with was in town just this weekend too to celebrate her mom’s 84th birthday–and there she was. Good times. I told her briefly how our son met and married their granddaughter. NO! she grinned. How cool! Yes! It’s very cool. I get to see how much my grandsons resemble Conway and I just love it. And that colonel was the great-uncle of the man I would later marry. Give us another few generations and maybe we’ll marry off one of ours to one of Ken’s and Francie’s. If we’re lucky. (Writing it down now like my grandmother did so the two families can all laugh over it come the day, right?) You just never know. Debbie was coming all the way from Fairfield for a quilt show and sent me a message: Purlescence was having an eighth birthday party tonight and that would be afterwards, so could we meet up there? And so we did, and we found ourselves a quiet corner a bit apart from the crowd and talked for over two hours, swapping stories, catching up, belonging in the best way that friends do, a too-rare moment together. I adore her to pieces. She reminded me of something I had utterly forgotten: she had asked me awhile back what color socks I wished I had. Oh blue, definitely blue, any blue, wait wait wait you don’t have to…! (She wanted to.) Well then no time pressure ever and if it ever happens I would love it and if it doesn’t don’t ever feel guilty. She had me try the first one on and it fit as if I’d been next to her through every stitch. We both cheered! She finished the very last bit of the second one right there on the spot (I loved it, that would so have been me, too) and ran the ends in, then made me take the first back off my feet–it’ll be stinky, I warned her with a grin, you sure, it’s been on that foot now, y’know–and she ran the end in on that one, too. And I sat there with the prettiest socks on in the whole entire yarn store, prouder than anything and just amazed and happy and grateful and wow. Thank you Debbie! There’s a lace pattern curving around it and I’ll try to show it off better later. I have very happy feet. I got asked about a month ago if I would teach a how-to-knit class at church tonight. Sure! Come the time to go, I was tired, I was grouchy, mostly over worrying about someone I know who had a brain tumor taken out today (wistfully cheering on Karen’s brother Paul from too many thousands of miles away), and I wasn’t at all sure I was even up to going. But I went. Boy am I glad I did. Sue to one side, me to the other, five newbies willing to give it a go and we were off. I had just said something about different knitting styles but they all make the same thing when Sue happened to walk out of the room and so the woman she’d been sitting next to brought her work over to me: let’s see, is this the right way to hold the yarn? I laughed. “Sue taught you so I can’t help there at all.” Then, “Wait, wait, come back here” as we all cracked up. Meantime, another who had struggled stitch after stitch after stitch trying to remember which way the yarn goes which way the tip goes no not that way oh right–persevered. Kept at it for an hour till she was sure she had it and was making good progress. I told them that the last time I’d taught a class like this at church, one woman two weeks later came back to me to say she’d made a baby blanket and two hats already. They looked at me wide-eyed. No no I wasn’t saying they had to do that–but rather, you can get good fast if you keep at it. Someone else had picked up yarn and needles so I wouldn’t have to run that errand. Which was very kind of her–but after our little group had been working their scratchy-acrylic Red Heart for awhile (really? They still make it like that? I had no idea. I didn’t say that though), I had them fondle my Malabrigo. OOOOooooooohhhhh. I explained, This is what keeps knitters knitting. Wanting to be sure they really did have it and not to lose any progress, three of them proposed on the spot to start a knit night–on, thankfully, Tuesdays, meaning I can go too. The plan is scarves for foster children. I had a blast. And this is only going to get more fun. I’m so glad I didn’t just throw in the towel and leave it all for Sue to teach alone.